Living in a relatively warm and comfortable state like New Mexico means that you get to enjoy the great outdoors. In fact, many homes in the region feature spacious backyards. A patio cover done right can enhance these areas beautifully. 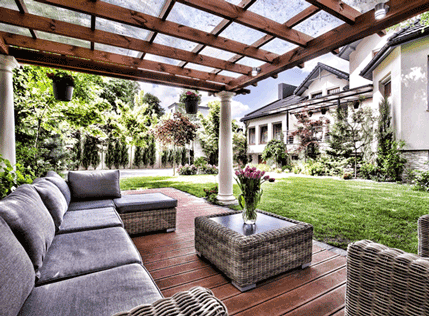 Dreamstyle Remodeling looks at three patio cover ideas worth the investment. Our solid patio covers in Albuquerque provide the most shade. Areas that receive a great deal of sunlight are sure to benefit from these covers. Our laminated roof panels feature a layer of polystyrene sandwiched between two aluminum panels. This provides the combined benefits of protection from glare and mitigation of heat transfer. Adding umbrellas over picnic tables across the rest of the yard will let you host bigger parties and add a splash of color overall. Freestanding pergolas are usually set up some distance from the home. This creates a distinct area where you can relax. Latticework is preferable in terms of design to allow some sunlight to stream through. While you would not want to set these covers up too near trees, it helps to have these under the branches of taller trees. This will provide the shade you need while not completely obscuring the sun. Latticework covers also work when attached to your home. Our Elitewood Classic Series patio covers in Albuquerque sport the look of elegant wood while possessing the strength and durability of aluminum. These will create aesthetically pleasing design patterns with shadows and light. You can complement these with stretched cloth. Not only do these provide fully covered extensions, as these also serve to inject color and vibrancy depending on the colors you choose. For more great outdoor ideas, Dreamstyle Remodeling offers many different and beautiful options. We also provide a great deal of indoor remodeling from the bathroom to the kitchen and more. Call us today at (505) 881-3200, and we will be more than happy to help. The crew that delivered our hydrotherapy tub executed the install flawlessly. I believe we found both in Dreamstyle.